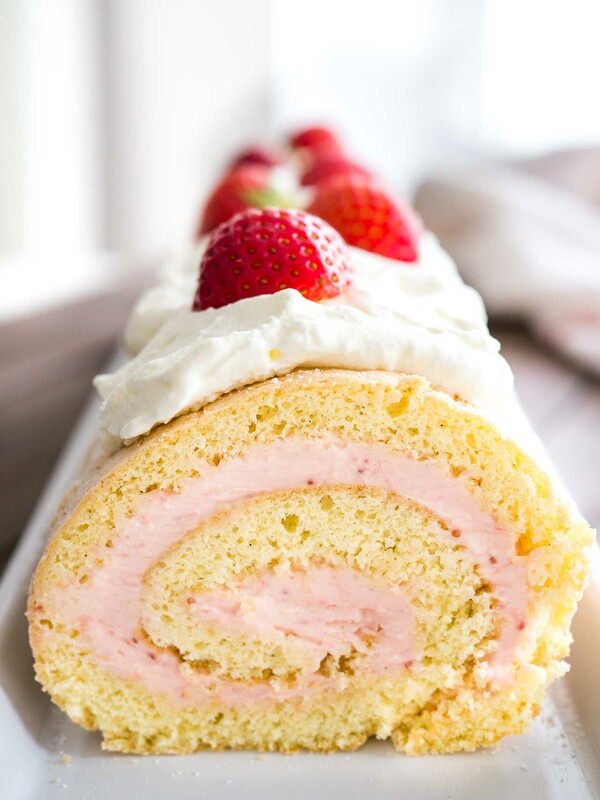 Strawberry Swiss Roll Cake is a light and refreshing cake that’s perfect for summer! 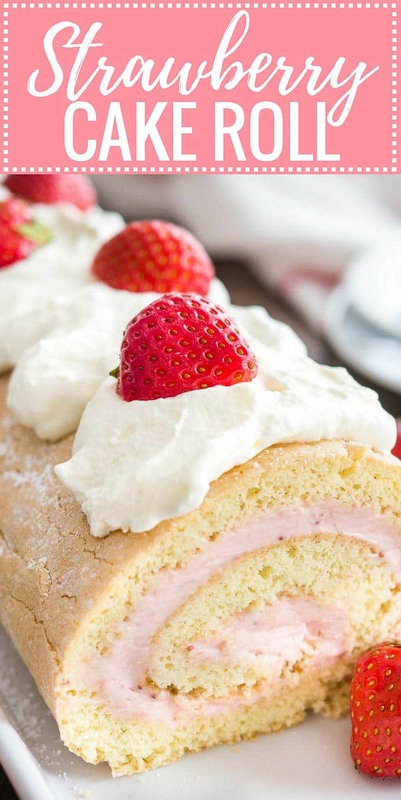 A fluffy cake roll that is easier to make than you think and tastes so delicious. Perfect for guests and special occasions! My secret for making the most delicious strawberry frosting is to make a reduction from freshly pureed strawberries. This way you get all the fresh strawberry flavor but only minimal moisture so your frosting won’t get runny. Making the perfect strawberry frosting has never been easier! 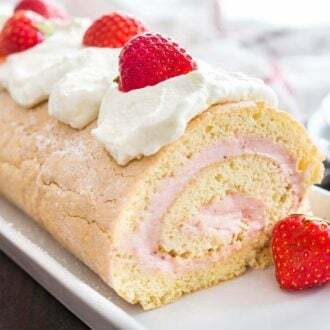 This show-stopping Cake Roll with Strawberry Cream Cheese Filling looks so pretty but is surprisingly easy to make from scratch and comes together quickly. 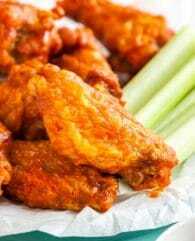 You could even make it a day in advance, refrigerate it and it will be just as good the next day. Perfect for summer parties! You can bake the cake roll one day in advance and store it (with the towel) tightly wrapped in plastic wrap in the fridge. Let it sit on the counter to come back to room temperature while making the strawberry filling. I find this makes it easier to unroll the cake. This cake is a sponge cake, a traditional European cake. It relies on the volume of the whipped eggs to rise properly so it is extremely important to beat the eggs and sugar for the time stated. The volume of the mixture should have tripled. Many sponge cake recipes are made without baking powder and the whipped sugar egg mixture is the only leaving agent. I always use baking powder because it makes the recipe fool proof. 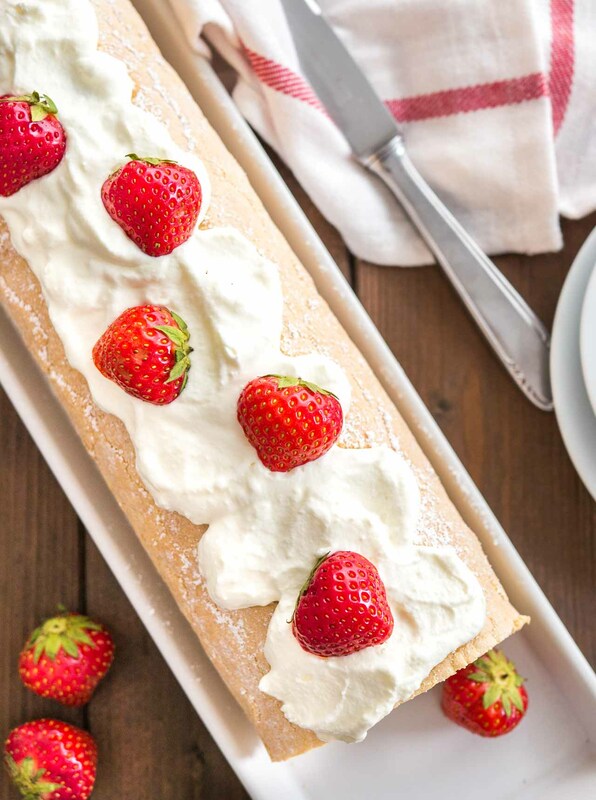 You need cake flour to make this swiss roll. 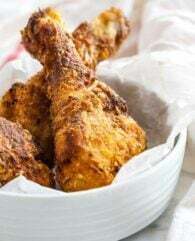 To make your own cake flour take 1 cup all-purpose and remove 2 tbsp flour. Then add 2 tbsp corn starch. Stir until combined and sift one time to evenly distribute the corn starch. Immediately invert the cake onto the towel once it comes out of the oven and roll it up. Don’t let it cool before rolling it or it will crack!! Reducing the fresh strawberry puree intensifies the strawberry flavor and remove the surplus of moisture that would make the strawberry filling runny. Instead of garnishing the cake with whipped cream you can also dust it with powdered sugar. Jelly Roll Pan: This heavy aluminum baking pan is perfect for this recipe! 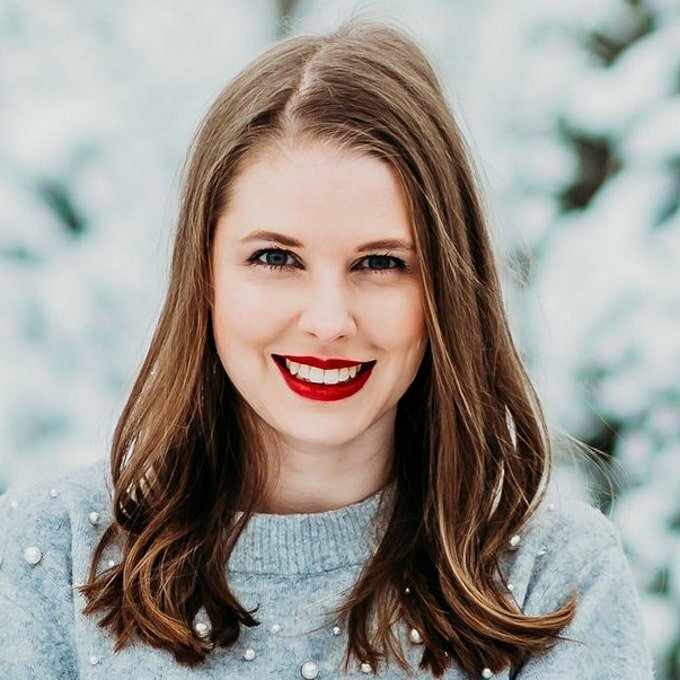 Cake Flour: This is my go-to brand for specialty flours! But you can also make your own cake flour, just scroll up to the tips and tricks where I explain how to make it. The most beautiful appliance in my kitchen! I own it in the gorgeous Ice Blue but the Pearl one is my current favorite color. Immersion Blender: I love my immersion blender! You can blend soups, fruits, or vegetables right in the saucepan and it doesn’t take much space in my drawer. 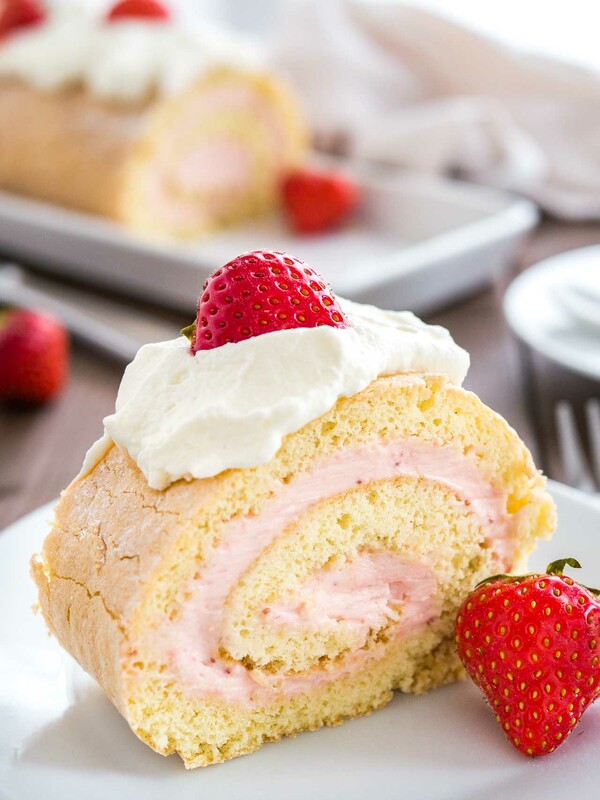 Strawberry Swiss Roll Cake is a light and refreshing cake that's perfect for summer! 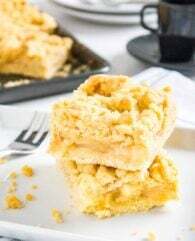 A fluffy cake roll that tastes delicious and is perfect for guests. Preheat oven to 410°F (210°C) and line a 15x11-inch rimmed baking sheet with parchment paper. In the bowl of a stand mixer fitted with the whisk attachment, beat eggs, sugar, and vanilla on medium-high speed until thick and pale and has tripled in volume, about 8-10 minutes. 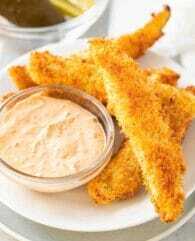 In a small bowl combine flour, salt, and baking powder. In three additions, sift flour mixture into egg mixture, folding to combine after each addition. Transfer batter to the prepared baking sheet and smooth the top with an offset spatula. Bake until light golden brown, about 10 minutes. Dust a clean kitchen towel generously with powdered sugar and Invert the cake onto it; slowly remove the parchment paper. You can brush the paper with a little bit of water to make it easier to peel off. Using the towel and starting at a short end, roll up the cake and towel. Let cool completely, seam side down. When the cake has cooled, make the strawberry filling. Using a handheld immersion blender or food processor puree the strawberries. You should have about 1/2 cup strawberry puree. In a small saucepan reduce the puree by half. Let cool. In the bowl of a stand mixer fitted with the paddle attachment beat butter and sugar at medium speed until pale and fluffy. Add cream cheese and mix until the mixture is whipped, white and fluffy, about 1-2 minutes. Scrape down the bowl as needed. Add the strawberry puree and stir into the mixture on low speed until just fully incorporated. Carefully unroll the cake. Spread strawberry filling evenly over the surface, leaving a 1/2-inch border on the outer short end. Gently roll up the cake tightly in the same direction you rolled it the first time (without the towel). 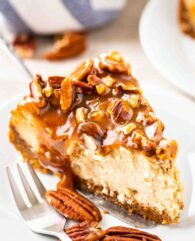 Place it on a serving platter and cut off the ends for a prettier cake if desired. 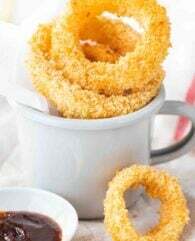 To garnish, beat together 1/2 cup heavy cream with 1 tbsp powdered sugar on high speed until whipped. Garnish the cake with dollops of whipped cream and strawberries. 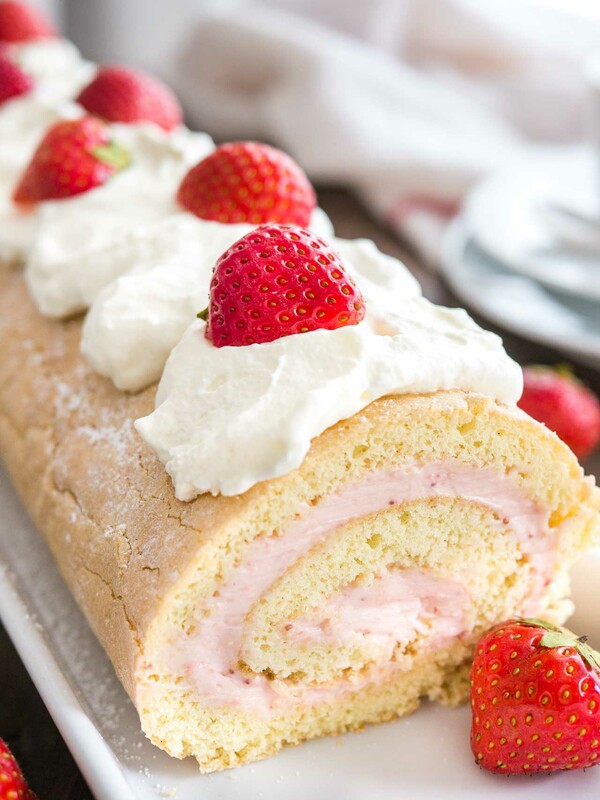 WANT TO TRY THIS STRAWBERRY SWISS ROLL? My first was roll ever. It came out perfect! I whipped up some decorating icing with egg white, flour and sugar, and piped a design onto my greased baking sheet and froze that for a few minutes before adding my batter and it made a perfect design. 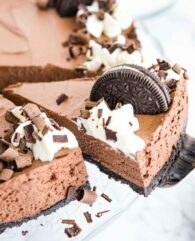 Will definitely be using this recipe again! Sorry this recipe didn’t work for you, Laura! I can only guess but what could have happened is that it was baked too long or your oven is running hot, it should not get crispy. I made this! The only thing I might do differently would be to refrigerate the filling a bit, just to make it a bit firmer so that the roll wouldn’t flatten on itself. Tastes wonderful was the first time making a sponge cake that turned out. That is one beautiful spiral! I watched The Great British Baking Show (I think that’s what it’s called….) one time and they were making Swiss rolls, and most of those cakes didn’t look as good as yours does! It sounds delicious, too!